A celebration of life memorial service for longtime Holly resident, Susan J. Bellomy will be held at 2:00PM on Friday, February 8, 2019 at the Peacock Family Chapel. Per Susan’s request cremation will take place and there will be no visitation. Susan was born on June 7, 1952 at Hennepin County, Minnesota to Otto E. and Lenore I. 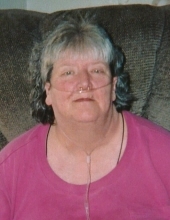 (Mauch) Voigt and passed away on February 4, 2019 at the Holly Nursing Care Center with her family by her side at the age of 66. Susan is survived by her children, John (Amy) Bellomy of Penn Valley, CA and Joanna (Tim) May of Bailey, CO; grandchildren, Joshua Bellomy, Kami May, Jonathan Bellomy, Seth Snider, Bryce May, Kerrigan May and Genevieve Bellomy and seven great-grandchildren. She is also survived by her sister, Margaret (Robert) Thom of Cannon Beach, OR as well as numerous cousins, nieces, nephews, other family and a host of friends. Memorial contributions may be made to the Second Chance Animal Rescue either direct or in care of the funeral home office. To send flowers or a remembrance gift to the family of Susan J. Bellomy, please visit our Tribute Store. "Email Address" would like to share the life celebration of Susan J. Bellomy. Click on the "link" to go to share a favorite memory or leave a condolence message for the family.